A fight inside a Portsmouth pub spilled out into the street leaving five people injured, police have said. Hampshire police said those injured in the brawl were a 19-year-old man who suffered a cut to his hand and neck, a 30-year-old man with a cut lip, a 50-year-old man with a cut hand, a 60-year-old man who suffered bruising to his body and a 25-year-old woman who sustained a bruise to her head. A disagreement broke out between pub-goers in the Froddington Arms in Fratton Road on Saturday. Some pub-goers tried to intervene but were assaulted, police said. Officers were called at 9.45pm when people were spotted fighting out in the street outside. Now police have said they want to speak to two men involved in the incident. One was white, aged 20 to 25, 5ft 10ins, of slim build and had dark hair. He was wearing a white polo shirt, light blue shorts and red trainers. The second mand was also white, betwene 40-50, 6ft tall, of slim build and had short dark hair. He was wearing a navy blue polo shirt, knee length shorts and navy blue slip on shoes. Detective Constable Paul Stenton, said: 'I am appealing for anyone who has any other information about this incident to come forward. Were you in the area at the time of the incident? At 10.20pm on Saturday police said they were being called to 19 grade one calls across Hampshire. By 12.25am on Sunday this had gone up to 30 grade one calls. 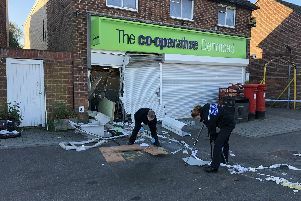 Posting on Twitter on Sunday morning, the man who represents the police rank-and-file, Hampshire Police Federation chairman John Apter, said officers had described the night as ‘manic’. It came after England beat Sweden on Saturday 2-0 to make it through to the semi-finals of the World Cup. Mr Apter said: ‘Spoke with control room and officers about last night. ‘Manic, job to job, stuffed, nightmare, knackered and dangerous were all phrases used! Anyone with information can call police on 101 quoting 44180255569.